Ann Ireland is the author of four novels, A Certain Mr. Takahashi, which won the $50,000 Seal First Novel Award and was later made into a movie called "The Pianist"; The Instructor, which was nominated for the Ontario Trillium Award; and Exile, which received three national award nominations and was cited as one of the year’s best books by Quill and Quire magazine and The Globe and Mail. Her most recent novel, The Blue Guitar was published by Dundurn Press in February, 2013. An excerpt has been published in Numéro Cinq magazine. Ireland's work has been published in magazines, journals, and anthologies nationally and internationally and she has appeared extensively on radio and television. She received a B.F.A. at the University of British Columbia in Vancouver in 1976 and has also lived in New York NY, Berkeley CA and Mexico. She and painter Tim Deverell and their son Tom now live in Toronto. Ireland teaches creative writing courses on-line and coordinates the Writing Workshops department at the G. Raymond Chang School of Continuing Education at Ryerson University. She is a Contributing Editor at Numéro Cinq magazine. 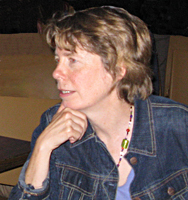 A past president of PEN Canada, Ireland has also served on the National Council of the Writers' Union of Canada and the Authors' Committee of the Writers' Trust of Canada. Ann Ireland, 2011. Simple theme. Powered by Blogger.